Architects J. 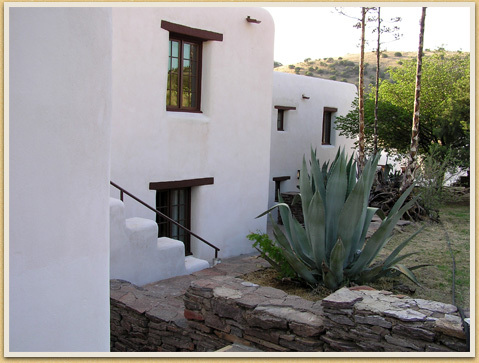 B. Roberts, Olin Smith, Arthur Fehr, William C. Caldwell, and landscape architect Roy S. Ferguson worked on Indian Village, a sixteen-room pueblo-style hotel set on the north slope of Keesey Canyon in Davis Mountains State Park. Built of hand-hewn pine beams and adobe blocks made onsite, the hotel was adorned by longleaf pine floors, casement windows, cane and log ceilings, hand-carved cedar furniture (built by the CCC in the shop at Bastrop State Park), and a plaza-like exterior courtyard. The completed interiors and exteriors artfully recall the indigenous adobe Native American and Spanish architecture of the Southwest. During the construction phase, CCC companies 879 and 881 molded adobe blocks from a mixture of water, straw, and soil and muscled tens of thousands of 40-pound blocks into place to form the twelve- to eighteen-inch thick walls, several which rise as high as three stories. The interior made use of locally harvested, hand-hewn pine vigas harvested from Mount Livermore, and river cane latilla ceilings that add to the “natural” character of the lobby. Company 1856, having already moved to Balmorhea State Park and the park camp at Big Bend, later worked at Indian Lodge as a side camp and added many features, including electrical wiring and a new roof. They also gave the lodge an initial painting to seal the portland cement plaster over the adobe-brick walls. Almost thirty years later, in 1964-1965, TPWD built a 24-room addition that included a dining room, meeting room, and swimming pool; it also “modernized” the original structure. In 2004-2006 TPWD took steps to restore the original section of the hotel to its 1935 appearance. Today Indian Lodge stands as a historically significant artifact of early automobile tourism, an example of Southwestern regional romantic architecture, a model of CCC arts and crafts revival, and an illustration of a popular place to visit during the World War II years.